A long weekend is just around the corner and if you’re still deciding on how to spend it, here’s good news! Go on a trip to the hills, frolic in the beaches and waterfalls, or explore another city’s unique cuisine – do it all with Ola Outstation. To make your getaway more fun, here is an offer for you. So go on, pack your bags, choose a destination and have a great road trip! Book your Ola Outstation ride today. This entry was posted in Uncategorized and tagged discounts, Long weekend, offer, ola, outstation on April 15, 2019 by Pooja Kiran. Get upto Rs. 250 off on you next Outstation ride! Who doesn’t love going on a holiday! It’s summer vacation time and you need to make the most of it. If you haven’t planned a road trip yet, we give you a reason that goes to the top of your list. Ola Outstation brings to you an exciting offer for your next getaway. You get to save big on your travel! Isn’t it an offer worth availing? So pack your bags, and book a ride right away. This entry was posted in Uncategorized and tagged discounts, offers, ola, outstation, outstation cabs on March 29, 2019 by Pooja Kiran. Watch the match in the stadium with Ola Outstation. India and West Indies face each other at Ekana International Stadium Lucknow on 6th Nov 2018. Witness the first international match at this newly built stadium for the first time in 25 years. When cricket is involved, distance is never a hurdle! We bring you an opportunity to go watch your favourite Cricket stars battle it out. Just take an Ola Outstation at these affordable rates. It’s time to shout from the stands – India! India! This entry was posted in Uncategorized and tagged BLEEDBLUE, Cricket, Ekana Stadium, India, Lucknow, ola, Ola Blog, outstation, West Indies on November 2, 2018 by sanjit roy. Here’s how to 2 Celebrate an anniversary! This entry was posted in Uncategorized and tagged #Letscelebrate2gether, 2 yead anniversary, 2nd year anniversary, Celebrate 2getherness With Ola Outstation, celebrations, Here’s how to 2 Celebrate an anniversary!, inter-city cabs, Ola Blog, Ola Cabs, ola outstation, outstation on May 30, 2018 by chetan warrier. Take a spiritual break this long weekend with Ola Outstation. Planning a trip to Shirdi this long weekend with the family? Take them in an Ola Outstation. The home of great saint Sai Baba, Shirdi is a religious site close to Nasik with various temples apart from the famous Sai Baba temple and some historical sites. Explore these places with Ola Outstation. Explore this spiritual city with Ola Outstation at fares starting Rs. 3299. That’s not all, we also have an exciting offer for you. This entry was posted in Uncategorized and tagged Journey, Mumbai, ola, Ola Blog, outstation, Shirdi, Travel250 on April 1, 2018 by sanjit roy. Choose your pick this New Year’s eve! It’s the end of another year, that means, you have probably planned, canceled and re-planned the perfect New Year Party. Whatever your plans are, Ola has the perfect ride partner for you. Here are some awesome rides that can accompany you for the New Year’s eve. So freeze your plans and ride into the new in an Ola. This entry was posted in Uncategorized and tagged christmas, Lux, new year, ola, Ola Blog, outstation, Prime, Rentals, SUV on December 16, 2017 by sanjit roy. This Diwali, simplify your travel plans with Ola Outstation! Diwali the festival of lights, is right around the corner and this calls for only one thing – your next getaway! Whether you’re planning to head back home, visit your loved ones out of town, or are yet to figure out your last minute Diwali getaway plans; Ola Outstation is here to make the most out of your travel plans during this festive period. So, pack your bags and get out with Ola Outstation and don’t forget to have a crackling time! This entry was posted in Uncategorized and tagged Diwali, Diwali250, ola, Ola Blog, outstation, Treebo on October 13, 2017 by sanjit roy. 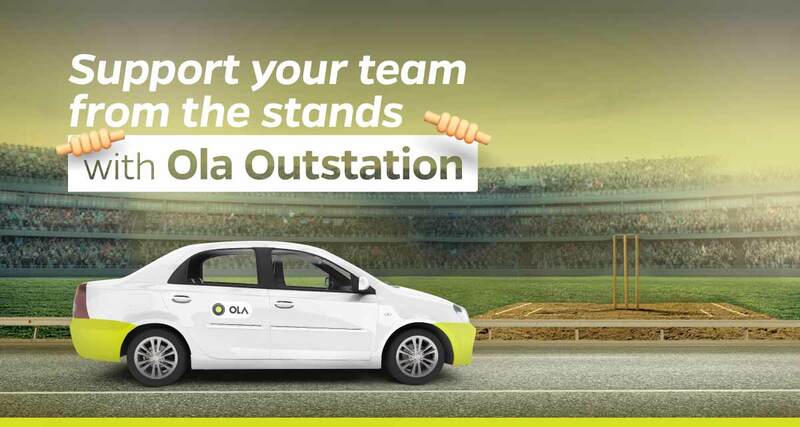 Head to the Ind vs Aus match in Indore with Ola Outstation. Crazy about cricket? Here’s your chance to head to the India vs Australia match in Indore. It’s time to show your support to your favourite players. Check Ola Outstation fares for one way and round trip between Bhopal and Indore on 24th Sep. We have an offer that will Fuel your passion even more. Use code FLAT300 and travel between Bhopal and Indore on 24th Sep to watch the match with Ola outstation and get a flat discount of Rs. 300 on your ride. This entry was posted in Uncategorized and tagged Australia, bhopal, Cricket, Ind, Indore, ola, Ola Blog, outstation on September 22, 2017 by sanjit roy. This entry was posted in Uncategorized and tagged chennai, ola, Ola Blog, OSPC, outstation, Pondicherry on August 31, 2017 by sanjit roy.